Born 1896 - Highbury, London, Freddie came from a large family with six siblings. His father, John Guest, was a London GPO mail sorter. Relinquished his commission in the 9th Battalion the Middlesex Regiment (Territorial Army) in 1921. Reserve of Officers. S.K, now wearing Hsu Heng (Henry)'s shoes and clutching his bible bible, sought refuge with the Reverend Cheng in the Harbour Mission Church on Ap Lei Pai opposite Aberdeen. He eventually made his way to Kukong in free China where Chan Chak was still recovering. SK arrived on 5th February 1942 still wearing Hsu Heng (Henry)'s shoes, only to leave two days later as mysteriously as he had arrived after falling out with Chan over the allegedly missing $40.000 (£2,500 GBP) They remained bitter opponents for the rest of Chan's life. 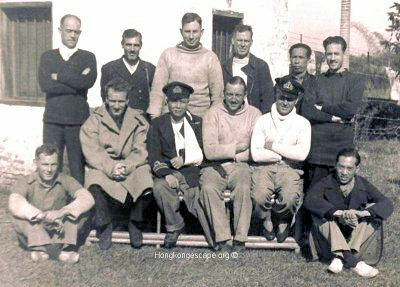 Cdr Montague, Freddie Guest, Peter Macmillan, Max Oxford, Bill Robinson, David MacDougall & Ted Ross left Kukong by truck to Nanxiong, an old walled town where there was an air strip. They flew out late that night, destination Chungking. Their arrival in Chungking in the early hours made the British national and regional press the same day 15th January 1942. After debriefing in Chungking Freddie flew out to G.H.Q Delhi, India. 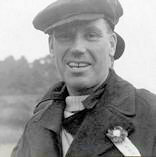 Guest left Chungking on 31st January along with Supt Bill Robinson and Sq-Ldr Max Oxford bound for Delhi via Calcutta. Freddie booked into the very grand "Great Eastern Hotel" where he was surprised to see a fellow Middlesex officer Captain Tony Hewitt. who had also escaped from Hong Kong almost two months after the Christmas Day escape party. He also found fellow escapee Captain Peter Macmillan who had left Chungking three days earlier staying there. Capt Hewitt  "Tony, How did you get here? 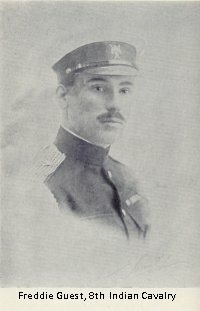 It was Freddie Guest, an officer in my own Regiment who had evaded capture in Hong Kong, leaving by sea with a Chinese Admiral before capitulation. He filled me with drinks, 'burra pegs' (Double Whisky), and took me into dinner in the luxurious hotel dining-room, still clutching my Red Cross bag. We were joined by a US Air Force officer by the name of Whitney, a son of the US Ambassador to India, who was sharing a room with Freddie. Whitney said 'we have three beds in our room. You can have the spare." Freddie eventually arrived in Delhi whereapon he met Bill Robinson. Freddie Guest "The first man I ran into was none other than Bill Robinson. 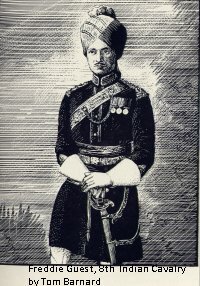 He was dressed once again in the uniform of a superintendent of the Indian Police, looking fit and well and as cheerful as ever." Freddie received orders to join the staff at the Officer Training Cadet's school in Bangalore training officers in the old art of pack horse and mule transport as the mechanised units were not appropriate for the terrain in Burma. Bangalore was the Southern Command HQ which extended from Bombay to Madras, right down to Ceylon. During his time here he oversaw some six thousand officers trained in Cavalry before returning to his home in Cheltenham in the UK in December 1944. Frddie Guest reported Admiral Chan Chak's death in the Gloucestershire Echo on 2nd September 1949. 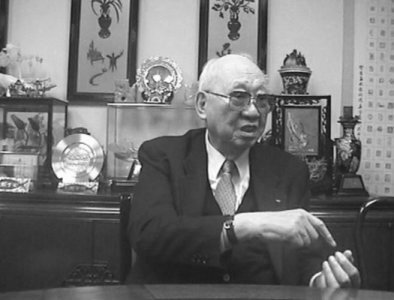 Left: 2006 Hsu Heng (Henry) recounting the machine-gunning of the Cornflower launch on Christmas Day 1942. 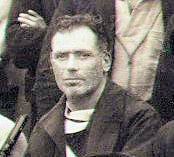 Freddie Guest was one of the twelve survivors HMS Cornflower's launch was machine-gunned when Adm Chan Chak's party made their break from Aberdeen. 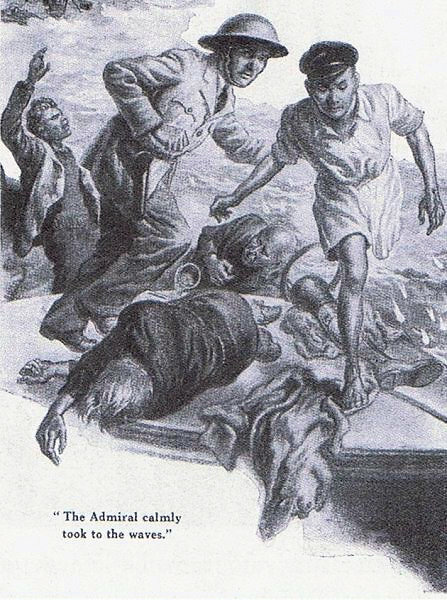 They had to swim for their lives in a hail of machine gun fire to the nearest island. After arriving in Chungking he flew out to G.H.Q Delhi, India. 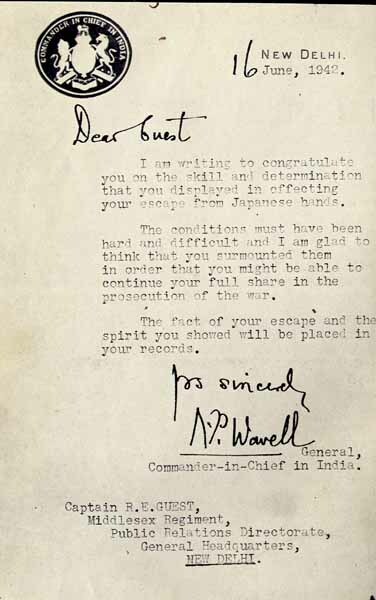 A letter to Freddie Guest from the C-in-C India, General Wavell.